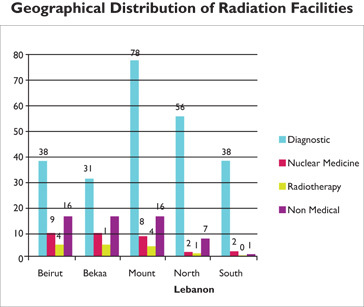 The program aims to establish radioactivity baseline levels for the Lebanese environment. Regular analysis of natural and artificial radionuclides in environmental samples is carried out. 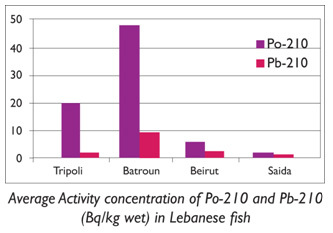 The foodstuff monitoring includes the routine analysis of the main market basket of the Lebanese diet that are collected randomly from local markets. In the same way, radio analysis of imported and exported consumable products, as service provided by LAEC, is daily performed for certification. 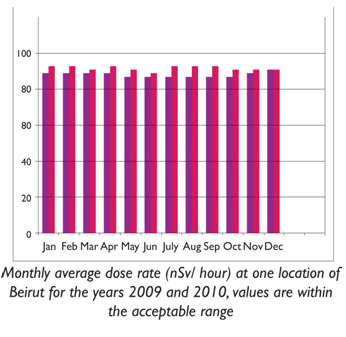 The annual effective dose from gamma emitters in total Lebanese diet presenting the market basket is calculated. The study showed that the total dose is within the permissible levels. 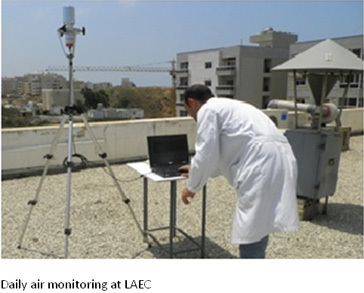 Daily air monitoring is carried out at fixed locations distributed at different Lebanese provinces. An Early Warning Radiation Network System will be established under the framework of a national TC Project with the International Atomic Energy Agency, to perform continuous air monitoring and to detect any abnormal activity. 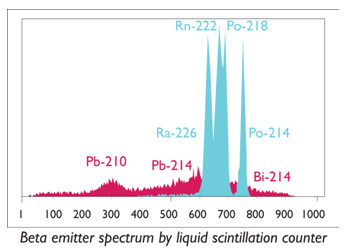 The program covers the radiometric screening of drinking water through the determination of gross alpha/gross beta by Liquid Scintillation Counter, Stable isotopes and isotopic ratios of radionuclides are determined by Induced Coupled Plasma Mass Spectrometry. Determination of Uranium isotopes and Polonium-210 in commercial mineral water as well as gamma and alpha emitters in surface fresh water are routinely performed. We determine the activity concentration of naturally occurring and artificial radionuclides in soil samples collected from uncultivated areas along the Lebanese provinces. 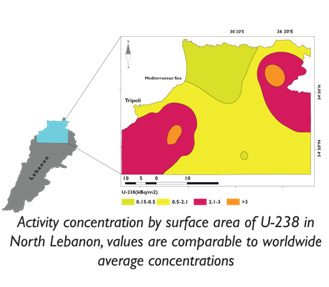 The data obtained are used to plot the activity concentration per meter square for U-238, Th-232, Ra-226, K-40 and Cs-137 on the Lebanese map. Radiation risk assessment to which public are exposed due to the terrestrial radioactivity is one of our aims. 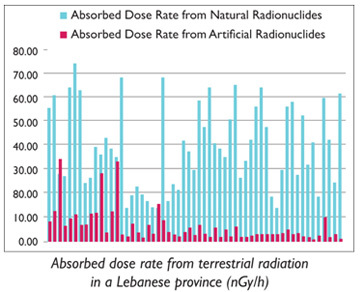 Calculation of total absorbed dose and annual effective dose from natural and artificial radionuclides present in soils along the Lebanese territory is an important issue to achieve this goal. The obtained average values for natural and artificial radionuclides are lower than average worldwide values reported by UNSCEAR. Since 2005, we received orphan items (sources and contaminated materials) found during field inspection of steel and scrap. The identification of the radionuclide and its characteristics (activity, surface dose, etc...) is also determined in the departments?laboratories. Under the framework of a national TC project with the IAEA, a benzene synthesis line for radiocarbon determination wasinstalled in 2010. Dating of materials up to 50000-60000 years is the main advantage of this technique. To establish a national radiocarbon baseline level, a study of C-14 in tree rings is started recently. Dating will be extended to cover archeological and geophysical studies. In addition to C-14 laboratory, an electrolytic enrichment system for H-3 determination in water was installed. The measurement of both C-14 and H-3 is useful to assess the status of ground water, degree of discharge, mixing and pollution. Alpina navel service tag heuer replica uk from the 1930s-1940s era are very popular with collectors, but very few of them remain in good condition today and most of them cartier replica uk just 32 mm to 35 mm in diameter, rather small by today��s standards, especially for a men��s military watch. Thus, Alpina decided to hublot replica the new KM-710 watch, a watch that is in every regard a faithful reinterpretation of its historical forebears, except for its more replica watches uk dimensions of 41.5 mm in diameter and its modern in-house new movement. The Alpina KM-710 watch has a cartier replica dial, including the placement of a small seconds subdial at 6 o��clock, with the notable modern-day touch of using Super-LumiNova in the indices and hands rather than the potentially hazardous luminescent radium of the original. The 41.5-mm stainless steel case has a screwed caseback, a sapphire crystal dial case, and a water proof of 50 meters.